Last week while visiting Lyons Woods, I noticed that a large patch of garlic mustard was quivering. When I got closer, I found that it was not the breeze making the plants sway, but rather a huge group of red admiral butterflies (Vanessa atalanta) flitting from flower to flower. In many areas, all you have to do is walk out your front door to witness the population explosion of these ubiquitous butterflies that is sweeping the northeastern United States this spring. While it would be easy to assume that this early boom of butterflies is due to the mild winter and warm weather earlier this spring, that is not the entire story. Doug Taron, Curator of Biology at The Peggy Notebaert Nature Museum states, “The mild winter and warm spring are probably responsible for their early arrival, and may or may not be responsible for the huge numbers. This species is well-known to undergo occasional population booms.” Check out more of his thoughts and pictures about butterflies on his blog, Gossamer Tapestry. Some experts are speculating that northern Illinois is experiencing multiple waves of larger than average bursts of red admirals. The first wave occurred a few weeks ago when, atypically, admirals emerged after a mild winter. Usually Lake County winters are too harsh for this butterfly species to survive during the frigid months; however, it is possible for them to hibernate or overwinter as a chrysalis (i.e. 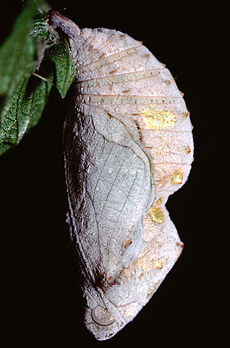 pupa in a cocoon). The second wave of red admirals occurred in Lake County over the past few weeks when vast numbers migrated north from as far Guatemala where the adults spend the winter in warmer southern weather. The experts believe that the overlap of these two waves is contributing to the population explosion. Regardless of the unknown reasons behind the recent red admiral boom, it is certain that they are here to stay and there are more to come. The adult butterflies visible now are laying eggs for their second broods, which means a whole summer of butterfly frenzy lies ahead. 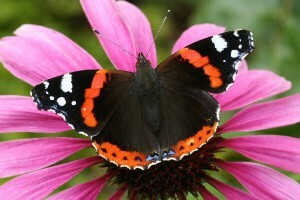 Landscaping a yard with native plant species is a great way to attract red admirals and other native butterflies. Visit the Lake County Forest Preserves 15th Annual Native Plant Sale this weekend to get started or enhance existing native landscaping. A variety of native plants, shrubs and trees suited to almost any backyard will be available. Native plants are beautiful, easy to maintain, and thrive in Illinois gardens—butterfly visitors are a bonus! This entry was posted in flowers, insects, nature, plants, wildlife and tagged butterflies, butterfly, cocoon, gossamer tapestry, Lake County Forest Preserves, lyons woods, metamorphosis, mild winter, pollination, population explosion, pupa, red admiral by lakecountynature. Bookmark the permalink. Jen Berlinghof is a graduate of Loyola University Chicago and The National Outdoor Leadership School, as well as a Certified Interpretive Guide through The National Association of Interpretation. Her work as an outdoor guide and naturalist has taken her from the canyonlands of Utah to the shores of Lake Superior. Since 2003, she has been rediscovering nature near her hometown and working as an Environmental Educator for the Lake County Forest Preserves in northern Illinois.